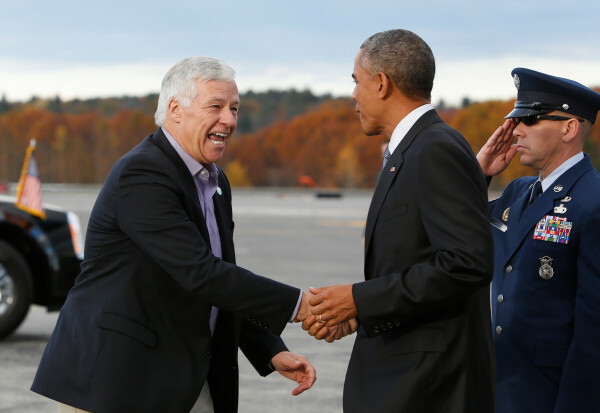 President Barack Obama arrives at the Portland International Jetport and is greeted by U.S. Rep. Mike Michaud in this Oct. 30, 2014, file photo. PORTLAND, Maine — President Barack Obama intends to nominate former U.S. Rep. Mike Michaud, a Democrat who represented Maine’s 2nd District for 12 years and ran unsuccessfully for governor in 2014, for a federal post leading the Department of Labor agency dealing with veterans training and employment, according to a Labor Department notice sent Thursday. Before his unsuccessful bid for governor, Michaud spent much of his time in Congress focused on veterans issues and in 2012 was the top Democrat on the House Veterans Affairs Committee. Michaud has laid low since the gubernatorial bid, for which he gave up his seat in Maine’s 2nd Congressional District. Peter Miesburger, an Air Force veteran and chairman for the legislative division of the Veterans of Foreign Wars, Department of Maine, lauded the nomination. “On behalf of veterans, they couldn’t get a better guy,” Miesburger said in a telephone interview Thursday. The announcement is not a formal nomination. The president sends formal nominations to the Senate, in writing, for consideration. The nomination would be referred to the appropriate Senate committee or committees for hearings before making a recommendation to the full Senate. Maine Republican Sen. Susan Collins serves on the Health, Education, Labor and Pensions Committee, which deals most often with Department of Labor matters. If confirmed by the Senate, Michaud would succeed Keith Kelly, who announced his retirement in March, as the assistant secretary of the Veterans’ Employment and Training Service. Kelly is an Army veteran, serving during the Vietnam War, and led the Veterans Affairs Committee of the National Association of State Workforce Agencies before joining the Department of Labor. Miesburger said he didn’t see it as a problem that Michaud did not serve in any branch of the military. “Within my circle, that was never brought up,” Miesburger said. The veterans’ employment training service is the lead federal agency on employment initiatives for veterans, including job training, transition assistance and employment rights issues. Members of Maine’s congressional delegation congratulated Michaud on the announcement late Thursday. In December, Michaud told the Bangor Daily News he intended to return to the Millinocket area, begin planning his retirement cottage in Medway and take time to think about his next step. Michaud was unavailable by telephone for comment on the nomination Thursday afternoon. Michaud represented Maine’s 2nd District in the U.S. House from 2003 to 2015, was a state senator from 1994 to 2002 and a member of the Maine House of Representatives from 1980 until 1994. He worked for the Great Northern Paper Co. in Millinocket from 1973 to 2002 and a leader of the union representing millworkers. He was one of few active union members in Congress.